The Samsung Galaxy Book 12 makes for a high quality unboxing experience. The tablet itself is an attractive sea of glass and aluminium, weighing in at X lbs. 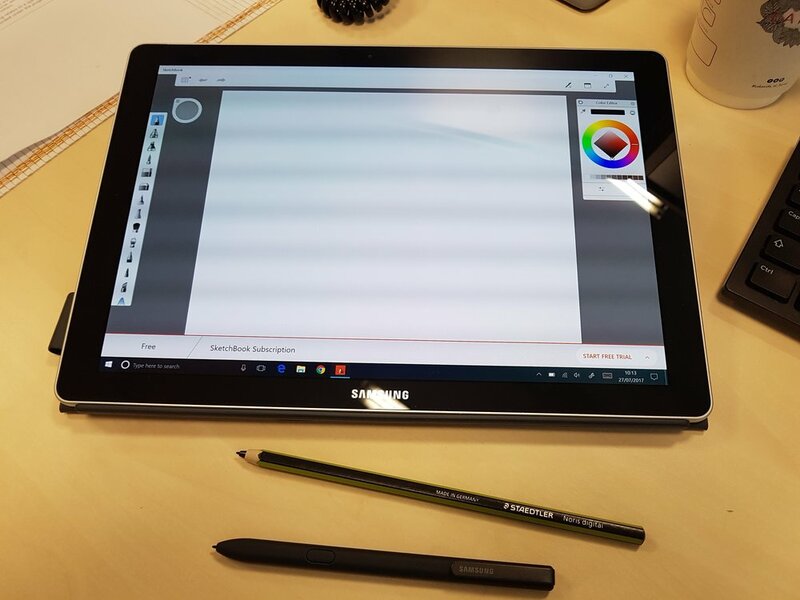 If you’ve unboxed any other circa £1000 tablet computers recently, you’ll know that you can’t necessarily expect there to be a keyboard and pen/stylus in the box, but happily Samsung give you everything you need under a single price tag. The folio keyboard seems a bit complicated to fit at first. Strong magnets guide the connectors together easily enough and it holds on tight. But how to stand the tablet up? Some helpful icons printed on the keyboard show four angles of recline, including one which gets the keyboard out of the way for scribbling and drawing with that ‘S-pen’ stylus. It’s not aparticularly elegant solution, but it works and I had no issues setting it up how I wanted it within a few goes. Oddly, I also found a secret-fold-number-5 where the keys went face-down on the table and the screen is brought forward, which is handy for Netflix sessions. The keys even switch themselves off, but I’d still prefer the tablet had it’s own kickstand. Speaking of Netflix, familiarity means unboxing may no longer be a ‘wow’ experience, but powering the tablet on is. The 12” super-AMOLED display is a thing of wonder. One of the best panels I’ve ever seen! Perhaps it’s a touch reflective for successful outdoor use, but the colour, contrast and motion will make Netflix viewers and creative professionals alike very happy indeed. When you’re not kicking back with a spot of House of Cards, the Samsung Galaxy Book 12 makes for a very capable computer. I will say now, it’s not a laptop, so I’m not going to complain too much about its middling abilities on your lap. If you need that, buy a laptop. The trade-off is weight and portability, which the Samsung excels at. Once at a flat surface, the keyboard is very nice to use. There’s a decent sized multi-touch touchpad, the keys are well spaced and they have good travel. My only criticism is that the power management of the keyboard is too aggressive, and you regularly find that the first key you’ve pressed after a gap in use has not been registered. The 'Staedtler' pencil is a fantastic creative stylus for artists and designers. The S-Pen is in the box for the rest of us. The screen is not large, but I can happily spend hours reading and editing documents, researching on the web and putting slides together without issue. The addition of a pen, and a decent camera on the back means I can also make handwritten notes, whilst capturing whiteboards and record audio in my meetings - something that a laptop isn’t always ideal for. All in all, the Samsung makes for an excellent productivity device, but it’s not without limitation. 4GB RAM is the minimum amount of memory you really want for Windows 10 and the 128GB hard drive is not exactly capacious. Especially once a chunk has been eaten up by the operating system. If you like to lug around a large amount of photos and video with you, then investment in a microSD card will be necessary (up to 256GB is supported). At this price, I would have expected more. Fortunately, there’s a decent processor and in use running office software and a modest amount of browser tabs saw little performance drop, even if the fans did get a bit busy from time to time. However, creatives working with photos and video should probably consider the upgraded model, which doubles both the RAM and storage in order to get the best out of this device. The Samsung Galaxy Book 12 comes at a time of great change. When you buy a portable computer, you can now choose between a tablet and a laptop, or a convertible if you want the best of both worlds (and the compromises). This tablet makes a great case for itself with the amazing screen, the excellent stylus and cameras and the good enough keyboard. Where there things come up a touch short are in battery life (good luck getting more than 5 hours of work done) and connectivity. USB-C only. Whilst USB-C is the future, it means dongles and adaptors for a while. Your very portable computer will have to be accompanied by various wires, chargers and adaptors for a while yet. But if you can live with tablet form compromises, the Samsung Galaxy Book 12 is a pleasure to sit in front of and should definitely be shortlisted.